The pleasures of great wine and great writers: Under the careful guidance of his father, Patrick Alexander began drinking wine with his meals at the age of five. At the same age, encouraged by his mother, he began a lifelong love-affair with books. The twin pleasures of wine and writing remained his passion for the next sixty-five years. He has raised his own children in many of the world's great wine growing regions, from Bordeaux and Piedmont in Europe to the Santa Cruz mountains of California while researching and writing his definitive guide to the novels of Marcel Proust. Learn about wine: Patrick Alexander originally developed the Wine Appreciation program when he worked at the University of Miami as Director of the Office of Professional Advancement. In the summer of 2011, after Patrick had left UM in order to focus on writing, Mitchell Kaplan suggested he offer his program at Books & Books during the quiet summer months. 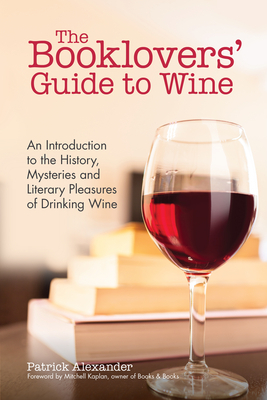 "It seems a pity to waste all that research" Mitchell said "and you never know; our book customers might want to learn about wine while enjoying great writers ." Six years, twenty-three sold-out classes, and four-hundred satisfied students later, Patrick Alexander's Wine Appreciation Program has become one of the highlights of Books & Books event programming. Patrick is also a published author and his writings include Marcel Proust's Search for Lost Time and The Nigerian Letter. Now, by reading The Booklovers' Guide To Wine you can also experience what Patrick's students have come to love and appreciate about great wines and great writers.